Got the CD today through a long box. CD Japan has not failed me once again! Anyways, the album is great. Some songs I have already but thats all good (after all, its a album XD). First press you get a Poster. Yum. New ones I hear are tracks 01, 02, 05, 07, 08, 10, 12. Then again, I get a strange feeling whenever that happens, I hope it does not end up being a sad feeling haha. Very unique. 虹色バス is great, fast paced(not too fast but hey, I like it very much). The song stands out with　テイク５. 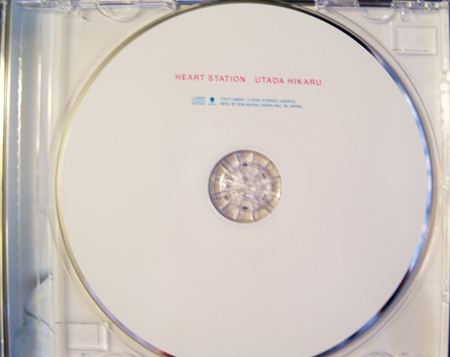 HEART STATION is awsome, melody is good and low keyed? Her voice takes the role in this one. The effects are great, listing in my head phones, theres a part where she whispers and its like leaning on the right side as if she was there whispering XD. Celebrate is great too, I love this track also. I though that she tried to go techy in the beginning haha! nice beats to the song. 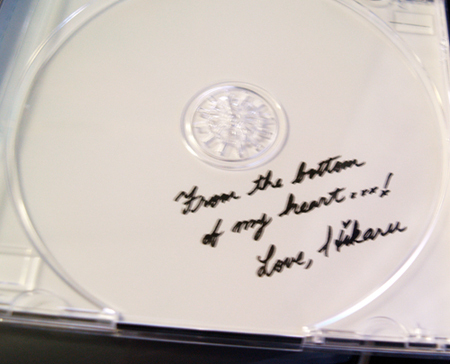 The CD, behind the disc tray, she left a message! Shame she didn’t include any Kuma-Chan photos in the booklet… ;_; oh Kuma-Chan… you miss out on the photo paper print!